Does the number of files affect fsck's performance? Will a 100GB disk with 1,000,000 files take longer than a 100GB disk with 100 files when running fsck? That depends on the file system and the switches you use with fsck. What fsck Checks and Tries to Repair gives a pretty detailed explanation of what fsck does when invoked without switches. Some of the checks take a constant amount of time (e.g., super block check), many of them depend on the number of inodes fsck has to process (e.g., link count checks), others on the file system's size (e.g., regular data block checks). The number of inodes of a file system is constant, i.e., decided upon at creation time. Each file's metadata is stored in one of such inodes. According to ext4, unused inodes are marked as such in ext4, but not in ext3. 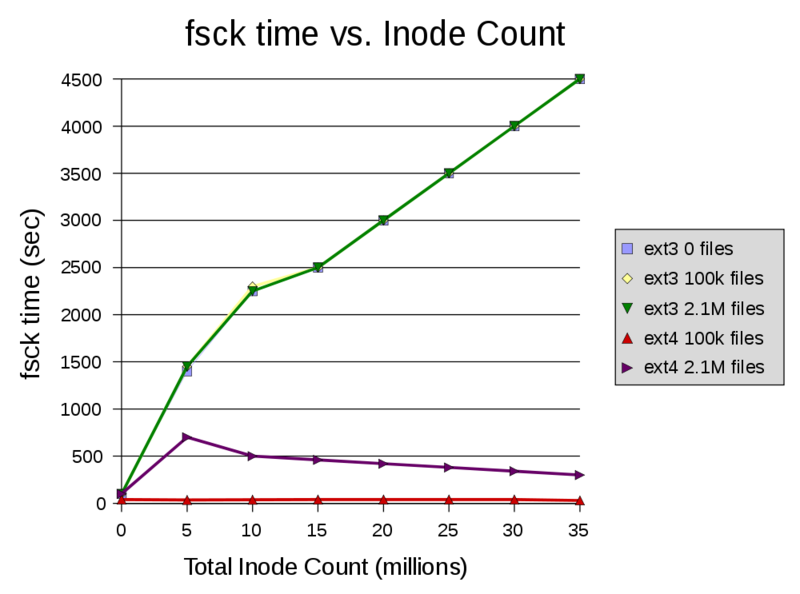 Thus, fsck's execution time increases with the file count in ext4, but is constant (and high) in ext3. Observe that the different file counts are represented by different colors. The graphs for ext3 with 2.1 million, 100 thousand and even zero files are identical. The graph for ext4 with 2.1M and 100k files respectively show a significant difference. In contrast, execution time increases with the number of inodes with ext3, while unused inode do not impact execution time with ext4. 1 Verified empirically by running fsck -c on an empty partition. Not the answer you're looking for? Browse other questions tagged linux performance fsck or ask your own question. How to tell when a machine is fsck-ing and hasn't had a kernel panic? How does disk size affect performance of a computer? Why does file system get error repeatedly even if I fsck it over and over again (on linux)? Why does removing a small number of large files take a long time? Does the amount of files on desktop affect computer performance?